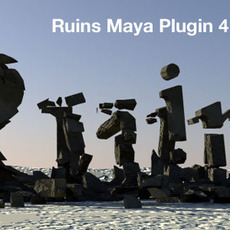 RUINS is a shatter plug-in for maya Very quickly and can be precision shatter. Ruins 4.5 can support OPENCLand PHYSX3.2.1 accelerated.... New UI and can use field to drived rigid body. what's new in ruins 4,5 ? 1 Support OpenCL, What's OpenCL ? GPU: Nvidia Geforce 8800 or quadro FX 4800 and 512M display memory above. Microsoft* Windows* 7 and vista, Linux , MAC OS 10.7; MAC OS support openCL perfectly! Add follow attribue... mean Rigid body can follow the movement of parent objects. ( joint or group). only use field to device.